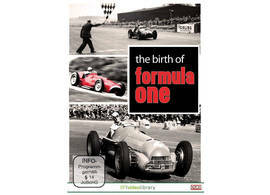 The product "DVD The Birth of Formula One" was successfully added to your wishlist. On May 13th, 1950, Britain's Silverstone circuit hosted a race which would go down in history - the very first Grand Prix of the modern Formula One era. Utilising rarely-seen black and white footage from the archive of BP, we are treated to the glorious sights and sounds of the first modern Formula One race, the 1950 British GP, also known as the Grand Prix d'Europe. We see the Alfa Romeo 158s of Giuseppe Farina, Juan Manuel Fangio, Luigi Fagioli and Reg Parnell do battle on the converted airfield racetrack. Then we witness, in colour, three amazing GPs from 1951, when the supercharged Alfa 159Bs went head-to-head with the 4.5 litre Ferraris at Reims, Silverstone and the Nurburgring. Our journey through the formative years of modern Formula One concludes with a return to the legendary 'Ring for the German Grands Prix of 1953 and 1954. Running time 63 minutes, English language.